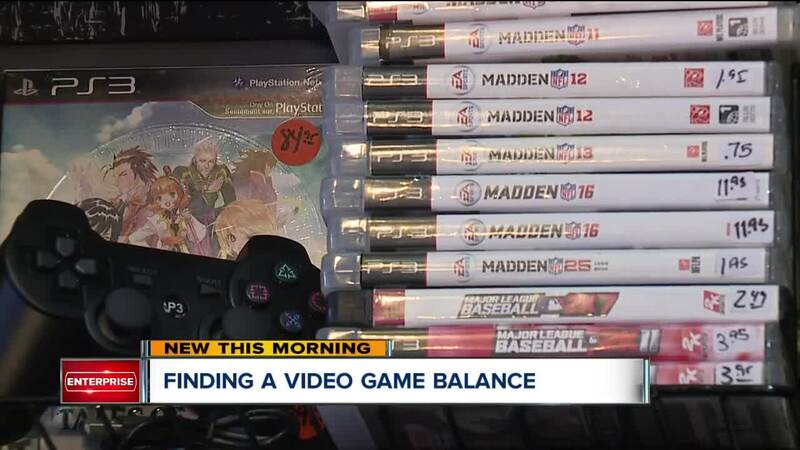 CLEVELAND — In a video game store full of some of the newest games right next to some of the most classic, Anthony Pancheri says the reason he comes back to the games he played as a kid is simple. "They were just really addictive," said Pancheri. Anthony Pancheri speaks with an employee at Video Game Connection about finding an old game he used to play when he was younger. He picked up a game first released in 2001, but he says even for kids that play games released just this year, like Fortnite or Call of Duty, the nature of the games and their consoles are to make sure the players keep coming back. "Things that are different now is the realism," said Cleveland Clinic Center for Pediatric Behavioral Health Dr. Vanessa Jensen. The Call of Duty franchise now represents an older style of video game, with a "Story Mode" and "Multiplayer" levels. She says better graphics since Pancheri was young means video games can draw players in even more, especially young kids. "You're there and you're in the world sometimes and the more you're in that world, the less you're aware of the world around you," said Dr. Jensen. Experts say virtual reality headsets make it even easier for players to forget the world around them when they use a headset like this one that blocks much of the rest of their vision. She says that's why it's important to know how children handle success and failure in the game because that can suggest limits for how much they should play. But the effects aren't all bad. Experts say video games still sell consistently every year, with updated teams and players released for each season. "Part of some of these games like Fortnite is you kind of work in pairs or groups so there is sort of this communal aspect to the games," said University Hospitals' Pediatric Psychologist Dr. Carolyn Ievers-Landis. Fortnite is one of the most popular games in the world right now, reaching more than 200 million registered users by the end of 2018. Dr. Ievers-Landis agrees that too much time playing video games can have negative effects, but it also might just be a way younger generations interact. The wall of video games shows how many options people who own any console have to purchase. "Telling each other, 'Watch out,' and 'Help me,' and I think for that part, there is a pro-social element to it," said Dr. Ievers-Landis. She says when parents limit how much time their kids spend in the virtual world, parents should have an idea for what the kids can do when they turn the games off. She says bored kids will only fight harder to get back on the consoles.